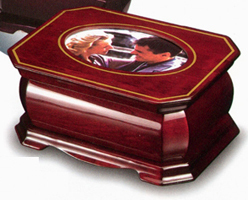 High gloss solid wood photo jewelry box with rosewood finish gold accent inlays, and single photo cut out on top. Double Decker box with lift out tray. 8 3/4" x 6 1/2" x 7 7/8"